Chapel of Our Saviour, an Episcopal church, is located at Fourth Street and Polo in southwestern Colorado Springs, near the Broadmoor Hotel. The church was founded in 1959 and the columbarium was established in 1976. According to GPS-derived geolocation (accurate to within 10 meters), the columbarium's coordinates are latitude 38°47'45.9"N and longitude 104°50'41.0"W.
The columbarium is located in an enclosed garden in the northwest corner of the property. Plaques are on the walls, and cremain interments are under the grass. 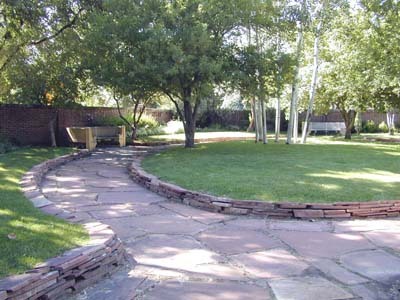 The beautifully maintained garden includes a stone walkway, benches, and shade trees. Anyone who is a member of an Episcopal church in El Paso County, or a family member, may be interred here. Records are maintained by the church, 8 Fourth St., Colorado Springs, CO 80906; phone: (719) 633-2667.